About a year ago in Nature astronomers reported evidence of an anti-glitch in the magnetar 1E 2259+586. 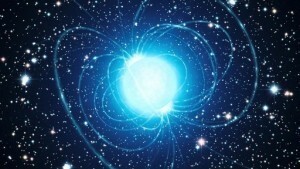 You might remember from yesterday’s post that a magnetar is a neutron star with an extremely strong magnetic field. This particular magnetar is also a pulsar, meaning that the intense x-ray beams that stream from the magnetar’s polar region happen to be aligned so that we see it flash regularly. You can think of a pulsar as a kind of cosmic lighthouse, if you will. The rate at which a pulsar flashes is determined by the rate at which it rotates. So if you see a pulsar flash 10 times a second, you know it rotates once every tenth of a second. (It can be a bit more complicated than that, but you get the idea). The rotation of a pulsar is usually pretty regular. Pulsars can gradually slow down over thousands or millions of years due to its radiated energy, but this is a gradual process. Occasionally, however, a pulsar will speed up just a bit in a very short time (on the order of minutes). This rapid speed-up is known as a glitch. After a glitch the pulsar will return to its previous speed within weeks or months, and then continue with its gradual, thousands-year slowdown. It is generally thought that these glitches are due to changes in the shape of the neutron star. Because of their rotation, neutron stars should bulge a bit at their equator. The faster their rotation, the greater the bulge. As a neutron star gradually slows down, its equatorial bulge would tend to decrease. But it’s thought that the neutron matter in the crust of the star is fairly rigid. This means that as the pulsar gradually slows down, stresses would build up in the pulsar’s crust. This would eventually reach a breaking point. The crust would then collapse to form a more stable, less bulgy shape. Because of this new shape, the pulsar would speed up a bit, just like a spinning figure skater who spins faster when she pulls her arms inward. We have observed lots of glitches in pulsars, and they all behave in a similar way. But the Nature article presents an observation of an anti-glitch. 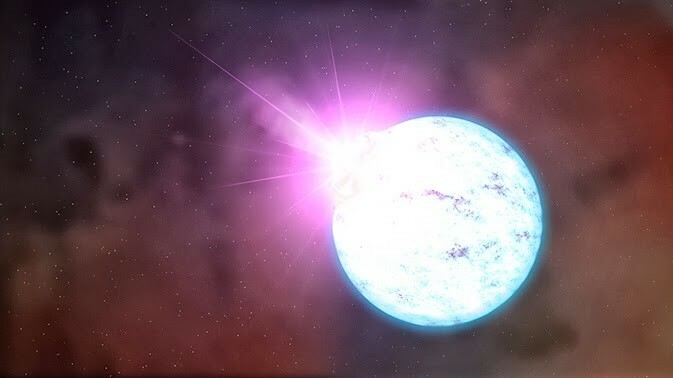 In other words, researchers observed a rapid slowdown in this particular magnetar. You can see this slowdown in the graph below. 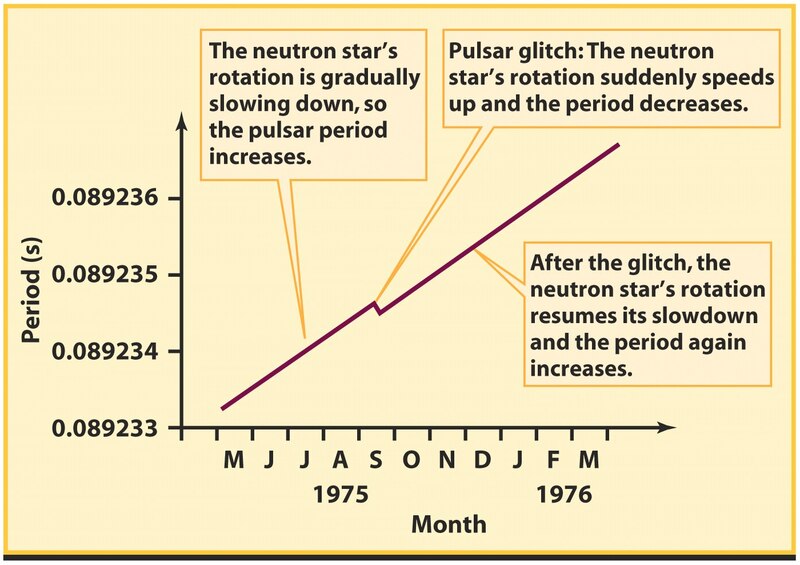 Such an anti-glitch is very strange, because it means either it was caused by an external interaction, or our understanding of neutron stars will need to be revised. The slowdown of this magnetar actually happened in two stages. There was an initial anti-glitch, and then a second shift that could be modeled as a glitch or a second anti-glitch, depending on how you look at it. This means the magnetar had a quick slowdown, then a second adjustment a little while later. This could have been caused by a twisting and reconnection of the star’s magnetic field. On the Sun, such phenomena causes solar flares and coronal mass ejections. If a similar process occurred on the magnetar, then it could slow it down by transferring some of the angular momentum from the star to the material ejected and the magnetic field. But such a process would likely cause an x-ray burst during both the initial anti-glitch and the secondary readjustment. Such activity was observed during the first anti-glitch, but not the second, so this doesn’t seem very likely. The alternative is that the magnetar is rotating differentially. That is, the superfluid core of the magnetar is rotating at a different speed than its crust. If that is the case, then as the crust shifted it could some rotation from the superfluid to the crust. The resulting transfer would cause the initial slowdown, and then the secondary shift would be caused by later readjustment into a more stable state. This model matches the observations, but it would mean that neutron stars can rotate differentially, which we didn’t think happened. If that’s the case, then we will need to reexamine the glitch model as well, since that may be caused by differential rotation as well. So it looks like we’ll need to look at pulsar glitches a bit more closely.